As far as the Canadian Hockey League is concerned, top NHL draft pick Nail Yakupov still belongs to them. The first-overall pick of the Edmonton Oilers had been hoping to spend his time locked out of the NHL at home in Russia playing for his hometown team, Neftekhimik Nizhnekamsk, in the KHL. But the CHL and Hockey Canada see it differently, since he’s still under contract to the Ontario Hockey League’s Sarnia Sting. Yakupov spent all summer telling reporters he wasn’t sure what his plans were, except that he wouldn’t go back to junior. In August at a press event in Toronto, he was directly asked if he would return to Sarnia. Late Wednesday evening, Hockey Canada president Bob Nicholson released a statement saying the decision on Yakupov’s future rested with Sarnia. The Russian federation also has seven days in which to respond to the IIHF in regards to Hockey Canada’s claim that Sarnia owns his rights. The Edmonton Oilers assigned Yakupov to Sarnia on Sept. 15, but according to Yakupov’s agent Igor Larionov, the NHL club had no problems with him playing against bigger, stronger players in the KHL. 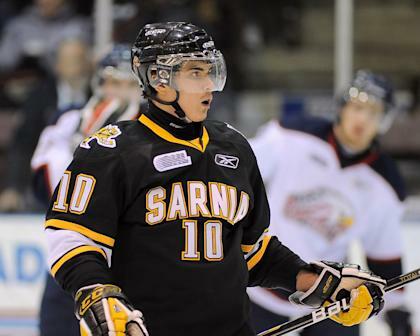 The Sarnia Sting have been publicly supportive of Yakupov’s decision, but in when it was suggested Sarnia had no problem with Yakupov playing in the KHL, Branch said that wasn't the case. “In terms of Sarnia, that is not what they are telling us,” said Branch. Sting GM and head coach Jacques Beaulieu said his team is just following the rules set forth by the CHL-NHL agreement and Hockey Canada. He said at this point he isn’t sure whether or not Yakupov would return to the Sting. At the same time, however, the coach-GM said he would understand Yakupov’s disappointment if he had to return to the Sting for a third OHL season. “We’re not in the business of holding people back,” said Beaulieu. “We’re in the business of developing hockey players and that’s what we’re paid to do. It’s unfortunate that he can’t play there right now (in the KHL) and we all hope for our organization and everybody’s sake that this gets rectified real soon. But the fight over top-end European and Russian talent is nothing new for the CHL. The issue of transfer agreements being given or denied by various hockey federations happens every year with various CHL clubs. Over the last few years CHL clubs have found it easier to bring talent over from Russia as compared to some eastern European countries or Sweden. There is the thought, however, that the fight over Yakupov could make the situation tougher for CHL teams if the Russian Federation decides to retaliate and make it even more difficult for their players to play in North America. Sunaya Sapurji is the Junior Hockey Editor at Yahoo! Sports.